Kennington Park, formerly known as Kennington Common, consists of approximately 20 acres and is still part of the Duchy of Cornwall though now managed by Lambeth Borough Council. From the earliest recorded times, the Common was widely used for fairs and gatherings of all sorts. Preachers including both John Wesley and George Whitefield held services on the Common to very large audiences with sometimes as many as 50,000 gathering to hear their sermons. In 1848 the Chartists held a meeting there and, although the Duke of Wellington called in hundreds of police in anticipation of trouble, the meeting ended quietly. The park lodge, known as the Prince Consort’s Model Lodge, was designed by Henry Roberts (1803-1876). A founding member of the Institute of British Architects, Roberts championed decent accommodation for the working classes and was a founding member of the Society for Improving the Condition of the Labouring Classes (SICLC). The lodge, designed to house four families, was one of two built for the Great Exhibition of 1851 in Hyde Park to showcase the SICLC’s ideas. After the exhibition, it was dismantled and re-erected on its current site. Following the formation of the park, local people who could no longer play games of cricket on the land, formed the Oval Cricket Club which was leased to the Surrey Cricket Club for a nominal fee. In 1869 Doulton and Co donated a statue by George Tintworth – Pilgrimage of Life to the park. In April 1848 the Chartists, a broadly working-class movement for political and social reform which took its name from The People’s Charter of 1838, organised a rally at Kennington. Estimates for numbers attending varied between 15,000 (the government), 300,000 (the organisers) and 50,000 (the press, probably the most accurate). The Duke of Wellington ordered that 8,000 soldiers and 150,000 special constables policed the event, to prevent a revolution, but in the end the event was peaceful. 1848 was a year when revolutions were bursting out all over Europe – France, Italian states, German states, Hungary, Switzerland, Romania, even Brazil. To top it off, Marx and Engels were in London. The government were not too happy about Kennington Common being used for dangerous mass events because it was too near to Parliament, so they enclosed it. 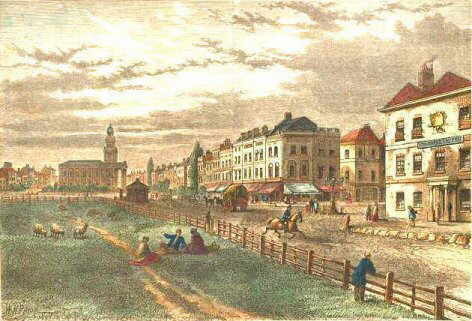 It became a public park, the first in south London. Prince Consort Lodge, the building that sits just inside the park facing Kennington Park Road, is also a legacy of the Chartists – it was built for the Great Exhibition of 1851 and was meant to be moved afterwards to Primrose Hill. Prince Albert (the Consort and President of the Society for Improving the Condition of the Labouring Classes) made a political decision to leave it in Kennington. The Friends of Kennington Park have published a pamphlet – The Springtime of the Peoples – celebrating the 160th anniversary of the Chartist rally on Kennington Common.